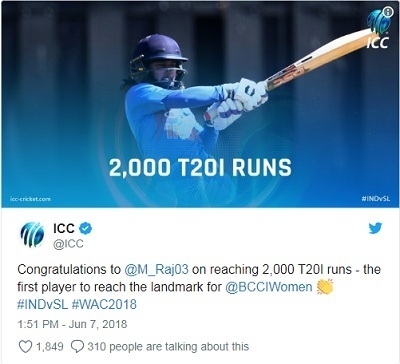 Mithali Raj has become the first Indian cricketer to score 2,000 runs in T20 Internationals. She achieved the feat during India's seven-wicket win over Sri Lanka in the Women's Asia Cup T20 at Kaula Lumpur. • Mithali became the seventh woman cricketer and the only Indian to achieve the T20I feat. • Indian men's team captain Virat Kohli with 1,983 runs is the next Indian on the list, followed by Rohit Sharma (1,852) and Suresh Raina (1,499). • Overall, the list is headed by former England captain Charlotte Edwards (2605), followed by current West Indies and New Zealand captains, Stafanie Taylor (2,582) and Suzie Bates(2,582). • Martin Guptill and Brendon McCullum from New Zealand are the only two male cricketers to have crossed the 2000 mark in T20 Internationals, with 2271 runs and 2140 runs respectively. Mithali Raj is the highest run-scorer in women's international cricket and the only female cricketer to have surpassed the 6,000 run mark in ODIs with 6373 runs from 194 ODIs. She is also the first player to score 7 consecutive 50s in ODIs. She also holds the record for most half-centuries in women’s ODIs. She is also the only cricketer (male or female) to have captained India in more than one ICC ODI World Cup final, doing so twice in 2005 and 2017. She is the first Indian and fifth woman cricketer overall to score over 1,000 World Cup runs. She was honoured with the Arjuna award in 2003. She was awarded the Padma Shri, the fourth highest civilian award in 2015. • Mithali Raj has played both Test and One Day International cricket for India's women's cricket team. • She made her One Day International debut in 1999 against Ireland at Milton Keynes and scored unbeaten 114 runs. • She made her Test debut in the 2001–02 season against South Africa at Lucknow. • The ace batswoman is a part-time leg-break bowler as well.